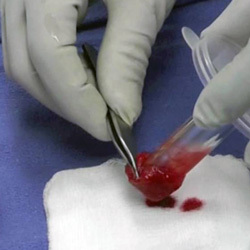 SUTURABLE BIO-SCAFFOLDS are formed by keeping the blood sample in motion via mechanical or manual swirling for 10 minutes. 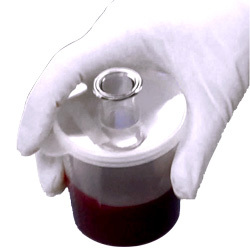 The user can select the shape and fiber orientation of the fibrin clot by adjusting the glass rod height from the base. 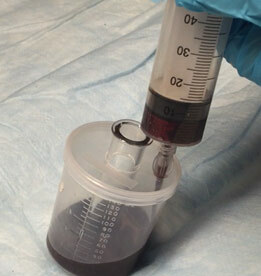 Constant motion of the blood for 10 minutes, will form a fibrin clot STRIP around the glass, or MEMBRANE under the glass rod. 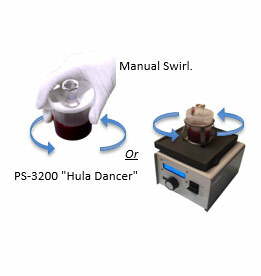 Automatic non-centrifuge orbital shaker for consistent 10 minute, hands-free formation of sterile Suturable BioScaffold, for the office or operating room. 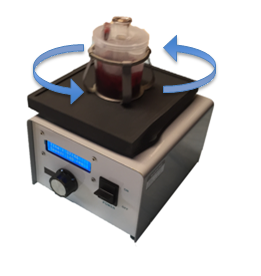 Variable speed and timer with automatic shut-off makes tissue engineering simple. 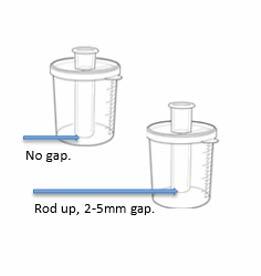 Suturable BioScaffold with Parallel Fibers: Place end of frosted glass rod all the way down so there is no gap between the bottom of Hula Cup and the glass rod. Suturable BioScaffold Membrane with Cross-linked Fibers: Place end of frosted glass rod 2-5mm from bottom of Hula Cup. Clot will form to fill gap.